So how do we calculate the last date of the month which is 4 months from now? 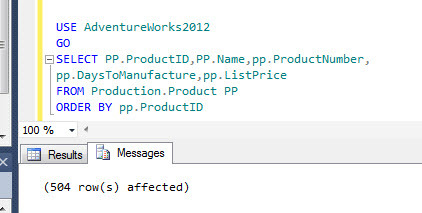 SQL Server 2012 presents EOMONTH() function. Let us understand this function with an example. So what do we find from the 2 outputs. Well it gives me the last date of the 4th month from the current month i.e. 4 months from now would be April and the last date of April is 30th. The second output gives the last date of 4 months previous i.e August. 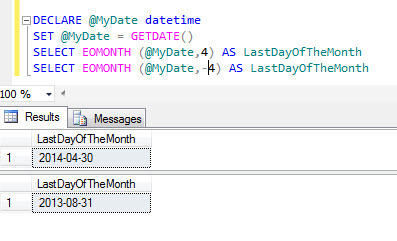 This function would be very handy in calculations where the last date of the month is a critical factor. Previously to achieve this we would have to do a bit of manipulation. The query returns 504 rows as depicted above. So what do i do if i need to fetch only a portion of the above rows? Here, the OFFSET tells the query to ignore the first 100 rows and then return only the following 10 rows. This is very easy to use and a quick way to return just a portion of records. a) ORDER BY is mandatory to use OFFSET and FETCH clause. b) OFFSET clause is mandatory with FETCH. You can never use, ORDER BY … FETCH. c) TOP cannot be combined with OFFSET and FETCH in the same query expression. d) The OFFSET/FETCH row count expression can be any arithmetic, constant, or parameter expression that will return an integer value. The row count expression does not support scalar sub-queries. 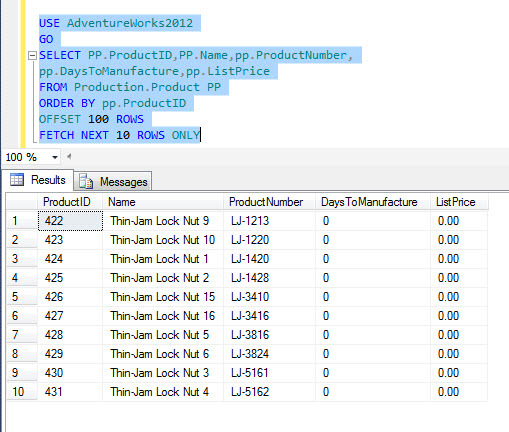 In this article I will discuss about the TRY_PARSE function in SQL Server 2012. Conversion functions helps us avoid errors when dealing with different data types. Let us understand TRY_PARSE with an example. The TRY_PARSE() function can convert any string value to a Numeric or Date/Time format. If the passed string value cannot be converted to Numeric or Date/Time format, it will result to a NULL. 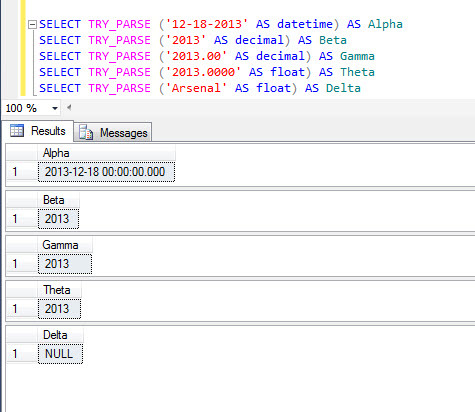 In the above case it would not convert ‘Arsenal’ to a date time or Numeric value and hence it results in NULL output. TRY_PARSE function is not a native SQL SERVER function, instead it is a CLR dependent function. 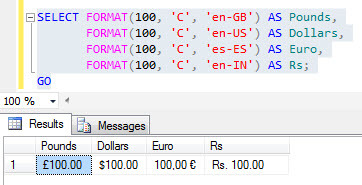 IIF is a new inline conditional statement in SQL Server. We can pass an expression that can be evaluated to either true or false to the function and it returns one value for true and another one for false. The output of the above as below. In this we have passed two different values. IIF is very useful where a straightforward comparison has to be made without writing case statements. 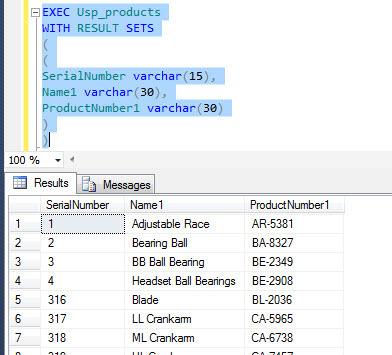 In SQL Server 2012, the execute statement has been enhanced with an option called ‘WITH RESULT SETS‘. So let us understand what this does. This option enables us to change the column names and data types of the returning result set from the stored procedure. Let us understand this with an example. Now let us use this new option and change the name of the columns and their data types while the procedure returns the output at run time. 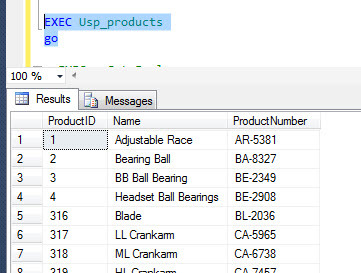 So this is how we can use this option to tweak the output set to different data types and column names from an stored procedure. SQL Server 2012 introduces this new function called FORMAT which returns a value in the specified format and also can optionally apply a regional format. This function relies on the .NET Framework. In this article we will explore this function and see how it can be implemented. FORMAT() accepts 3 parameters. The first parameter is the VALUE parameter where we pass on the date value or a numeric value. The second parameter is the .NET Framework format string. The format parameter is case sensitive. The third parameter is the culture. This can be any culture supported by the .NET Framework. For more details on this function please refer to this msdn link.